Creating flip books is super easy, just upload your PDF or images and insert the shortcode into your post or page. Just upload the PDF or images and your 3D book is ready. You can create 3D book directly from the PDF file. All links inside the pdf will automatically work inside the Flipbook. 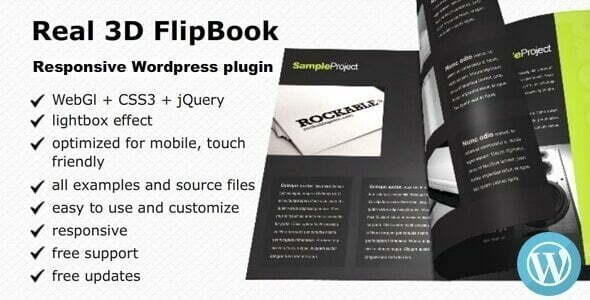 The flipbook work on all platforms – desktop & mobile. The default WebGL mode offers realistic 3D page flip animations with page bending, lights and shadows. This mode is supported on most desktop browsers. In case WebGl is not supported there is a fallback CSS3D mode that uses only CSS3 animations. This mode works on all modern desktop & mobile browsers. CSS3D mode can also be used as default mode. There is also the Single page mode can be used as default or can be used only on mobile devices. With lightbox mode you can put a text link or an image link anywhere on your site and by clicking on a link the flipbook will be opened in a lightbox. This way you can have multiple books / magazines / brochures on the same page. Responsive mode creates a flipbook with optional size that can be put anywhere inside a page or post. With Fullscreen mode the flipbook will cover the entire page.